Ganesh Chaturthi is one of the most awaited and celebrated festivals in Mumbai. A festival which brings the city together, which is a reason for happiness and in which religion doesn’t matter. There are thousands of Sarvajanik Ganesh Mandals vying for the title of the biggest, the wealthiest or the most beautiful idol of all. Efforts of the artisans who put their skills to test throughout the year are finally rewarded when their idol wins. Among all these idols in Mumbai, Lalbaugcha Raja which transliterates to “The King of Lalbaug” rules the roost and how! I’ve been visiting the King of Lalbaug consecutively for the past 6 years. At Lalbaug, the idol is kept for public display for eleven days and thereafter it is immersed on the auspicious day of Anant Chaturdashi. Its believed that this Idol of Lord Ganesha is Navsacha Ganpati, which means the “one who fulfills all wishes”. No wonder 1.5 million people visit this Ganesh Pandal daily during the 10 day festival. The idol, now in its 80th year, stands a magnificent 12 feet tall and has a divine aura around it. 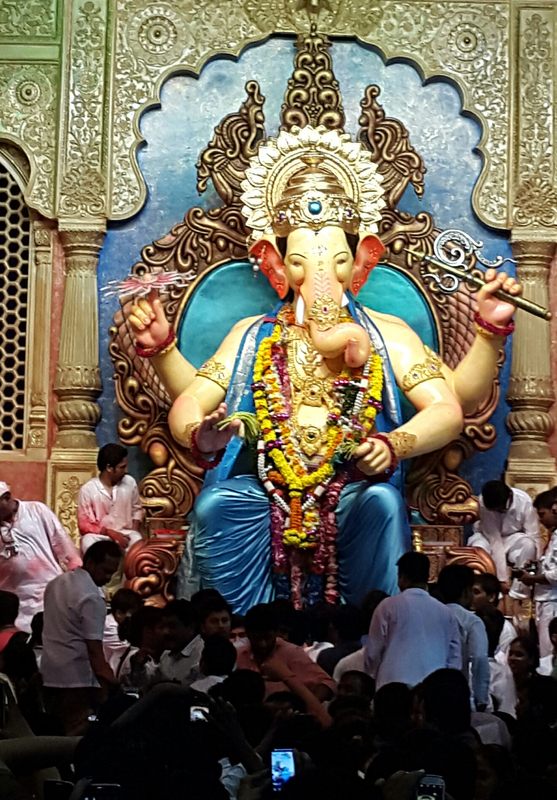 There are two queues for taking blessings of the Lalbaugcha Raja – the Navas or the Mannat Line and the Mukh Darshan Line. The Mannat line lets you on the stage and touch the feet of the idol. It attracts huge public and takes around 25 to 40 hours to get darshan. Crazy is the word! The Mukh darshan line gets you a glimpse of the idol from a distance without going onto the stage. This is fast-paced and less taxing. My sister always opted for the former, the Mannat Line and coaxed me to do so in my maiden visit. It was a good 18 hours wait before we could touch the feet of the Lord. A real test of patience and persistence! That was my first and last experience of toying with the idea of the “Mannat Line”. I am a devotee but not the penance kinds. So from next year, I was content with the “Mukh darshan” itself 🙂 . Its equally exhilarating and with much less efforts. We planned our visit in such a way that we get darshan in less time and the place is comparatively less crowded. It was the fourth day of the festival. We started off at 4 am. The place is as lively as it would be during the day hours. Brightly lit up area ensures your eyes are wide open however sleepy they may be. Gigantic hoardings stare right down at you. There are police men everywhere to maintain the law and order. Barricades maintain the queues. The tea-vendors roam around on their bicycles untiringly trying to sell tea even in those wee hours. There are few make-shift refreshment stalls to help grab a quick bite. Garlands and offering stalls are scattered everywhere. and there are non-stop announcements reminding you to take care of your kids and belongings. Suddenly someone shouts an impromptu “Ganpati Bappa” and all the unknown others quickly and loudly respond “Morya”. A wonderful feeling of unity that is! Our cabbie, reluctant to dare making his way into the crowd, dropped us at least a kilometer before the starting point of the queue. People were running, sprinting, jostling, doing every possible stunt to get ahead in the line. There was a lot of pushing and shoving, but none seemed to care, except for a few frowns. I saw a man carrying a child in his arms, who tried to barge in the middle of the queue by squeezing himself and the child from the space between the barricade. In the meanwhile, he also managed to bang his head on the rod, and with a bit of “ouch” he rushed ahead to continue his mission. Devotees included people across all ages, backgrounds and faiths. There were office goers in formals and with their laptop bags who seemed to have headed straight after their office hours. There was septuagenarian lady who sauntered with the help of her middle-aged son at one hand and her old husband at the other. There were parents trying their best to keep their kids together, teens who seemed in more of a party mood. The homeless slept under the flyover, oblivious to all the hustle-bustle around them. Buying of offerings and a little rambling later, we were inside a huge pandal where the queue was strategically planned, and which would lead us to the main area of darshan. Inside the pandal was an enormous LCD that incessantly gave a live feed of the happenings in the vicinity of the idol. It took us numerous pushes, shoves and twenty minutes to get in the open and the final stretch from where we could see the beaming Lord. Not clearly though, with all those raising hands trying to capture His glimpse on their cellphones. My husband had volunteered for this, while I began mumbling all those prayers I knew and the long list of wishes I had on my mind, till the time I reached the idol. Finally, after battling the crowd, it was my turn to get the sight of the Lord in His full glory. It was just ten seconds, before I could even soak His mesmerizing beauty, I was pushed towards the exit. Its narrow already and is further narrowed by the flooding of small stalls that sell the Ganesh merchandise. The brownish Mawa Pedha sold here is otherwise a rare find. A heavy heart , ten minutes walk and a sip of coffee later, we hailed a cab back home. “Ganpati Bappa Morya! Pudhchya varshi lavkar ya” echoed in my ears in a rewind-and-play mode. Such is His intensity! The latest news that was flashed in the newspapers was that the pandal had around around 1.5 crore visitors during those eleven days when the idol was for display. The pandal also has an insurance cover of around Rs. 50 crores and reportedly got donations of around 7 lakhs in cash, about 6 kg gold and 100 kg silver. Can you imagine, people donate cars too! Its amazing how faith makes us do things that are beyond imagination and understanding. I am a worshiper too and its my faith in Him that pulls me here every year. But the thought of bartering with the Lord, somehow doesn’t agree with me. I mean, what’s God gonna do with cars, gold, silver, money? Does He even understand these worldly materialistic pleasures? How can anyone even think of asking something from God for something in return? Basically its a way of bribing the Lord, isn’t it? Big people, big bribes! I still remember a chapter we had in school, about a poor man who earned his living breaking down huge stones in the sweltering heat. That was when I first learnt what “Sweat of one’s brow” literally meant. And that was when I first learnt that God is present right here, in the destitute and the deprived. I grew up, but never did forget that chapter. Since then, I try and do my bit whenever and in whatever way I can. We owe a lot to the society we live in, don’t we? I wish, these opulent guys understood even a bit of it. Imagine how many empty stomachs would be fed by a simple shift of thinking. The Lord would rather be happy this way, right?